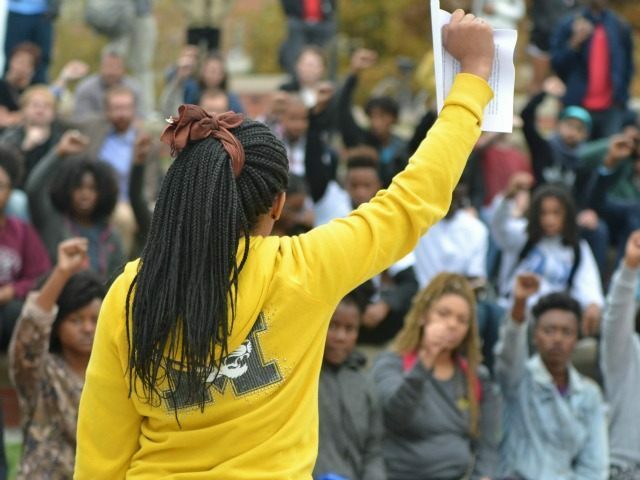 The Concerned Student 1950 activists at the University of Missouri, connected to the Black Lives Matter movement, got their scalp, and it’s just the beginning. The resignation of of University of Missouri System President Tim Wolfe is major victory for the student movement, and their supporters know it. Black students organizing against racism @Mizzou @Yale part of national movement inspired by #BlackLivesMatter #CivilRights #Social Justice. To have the university system president to resign, that's huge! Wow great work #ConcernedStudent1950 other schools are on notice! These activists used pure intimidation tactics to terrorize the campus, cause the black members of the Mizzou football ream to strike, and force Wolfe into apologies and finally resignation. In this video, one of the activists admits, “We’re trying to break the system down… it just so happens we’re starting with him.” Given the hydra of hysterical campus activism that Breitbart News has reported is springing up across the nation, it’s hard to know where it will end. They screamed the words of convicted cop-killer and hero to the Black Lives Matter movement, Assata Shakur. However, the big victory was shutting down the homecoming parade as stunned onlookers–including many small children–were forced the watch the megaphone-wielding activists scream at the crowd about slavery while blocking now ex-president Wolfe’s car. At the end, they all chant Assata’s “Letter To My People” again. Consider what happened in Missouri: activists using intimidation tactics, quoting a communist terrorist, took down a university president. Nobody in the mainstream media has called them on any of this. And the 2016 election is less than a year away.